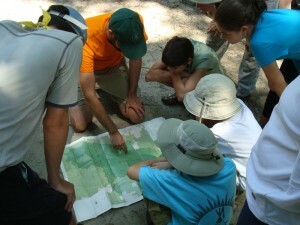 Sure Foot’s guides provide various workshops for groups of all types. Our workshops are hands-on, interactive, and FUN! To schedule a workshop for your group, please contact us. The basics of camping & backpacking, including gear, knots & shelters, choosing routes, cooking, animal encounters, etc. Have you ever wanted to know how to use a compass? Can you look at terrain and draw a map? Do you love exploring nature? This class will teach participants how to think visually and translate land to map and vice versa. Participants learn hands-on a set of all-purpose knots, taught in order of difficulty, including square, half hitch, slippery hitch, trucker’s hitch, taut-line hitch, bow-line, slip figure-eight, and prusik. After a good deal of practice, we use each of our knots to build an effective tarp shelter. The instantaneous change of energy from friction to flame through your hands will become a part of you and will leave a lasting impact. Join us in exploring the primitive art of creating fire. On this 4-6 mile walk, participants learn the basics of orienteering, map reading, compass skills, GPS technology while participating in the international treasure-hunting game of geocaching. We learn the history of Atlanta while walking the Grant Park neighborhood, Stone Mountain park, or Mt. Arabia seeking 6-8 geocaches. An introduction into the history and culture of Appalachian Trail hiking, including gear, logistics, and physical training tutorials.